Google Keep is Google's free note taking app that makes it easy to type, dictate, draw or snap a photo to create a note. Keep's desktop version, Android and iOS apps synchronize seamlessly so that your notes are always accessible across all devices. As part of the Google family, Keep integrates with Google Calendar and Contacts, and other Google products you may already be using. In addition to time and location-based reminders, Keep also allows you to share notes for live collaboration. The Google Keep app looks and operates almost identical on both the Android and iOS apps. The only time there is a difference between how the app works on these devices is when you interact with the phone's software, such as saving a bookmark to Keep. Here are instructions for the app, desktop versions, and for specific devices as needed. Keep is available as an app that you can download for Android and iOS. 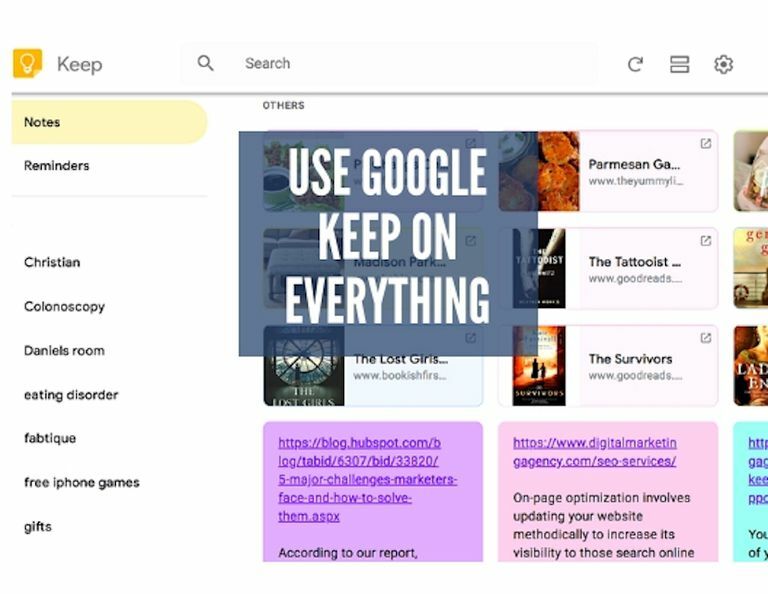 You can access Google Keep on the desktop using Keep's site. If you are a Chrome user, you may also want to grab the Chrome extension to make it easier to save bookmarks as you surf the web, which we will discuss later. Once you've downloaded the app, or are on the Keep page on your desktop, you will be asked to enter your Google account information. You can choose preferences for the way you engage, and how Google Keep appears in the Settings menu. On the desktop, find settings by clicking the gear at the top of the screen. On mobile, find the settings by tapping the three horizontal lines on the top left of the screen. Control the way notes appear, times for reminders and whether you see images on bookmarks with rich links. To create your first note, tap or click Take a note in the rectangular box on the Keep screen window. Start typing, or expand the + at the bottom of the note to take a photo, choose an image, draw or dictate your note. Once you've created your first note, your note is automatically saved. You can continue to add photos, recordings, drawings or other text to your notes, or create a new note. Keep uses labels and colors to help you organize your notes. You can create as many as 50 different labels to organize your notes, and a single note can also have multiple labels. Desktop: Add labels to multiple notes by hovering over notes and clicking the check mark. Select the note(s) you want to label, click the three dot menu in the upper right, and click change labels, and type the name of the label you want to create. You can also select the palette icon to see a pop-up window of colors. Mobile: Add labels to a note by selecting the three dots in the bottom right of the screen to see the labels option. And, or organize by color by selecting one of the colors that appears at the bottom of the screen. Whenever you create a new note, type # and begin typing the letters of the label for the note, and Keep will bring up a list of your labels that match. Select the label you need. Keep automatically adds the last note created to the top of the Keep workspace. If you have a running to-do list that you want to always appear on top, you can Pin the note so that all the other notes stay behind. Google makes this step really quick and easy by placing a thumbtack icon at the top of both the desktop and mobile versions. Click or tap the thumbtack pin the note at the top of your desktop. You can do this for as many notes as you need to keep on top. To unpin a note, simply click or tap the thumbtack. If there are notes that you do not want to see on your desktop, but still need, you can archive the note. The note is still in Keep, but you won't be able to see the note on your desktop. Archived notes still show up in a keyword search. The archive button looks like a file folder at the bottom of the note on the desktop version, and at the top on mobile versions. You can see all of your archived notes at once by selecting Archive from the keep menu by tapping the three horizontal lines at the top left side of the desktop and mobile versions. To remove a note from the archive, simply re-select the archive button. If you draw a note, or create a photo note, Keep uses Optical Character Recognition (OCR) to turn any words within the image into text. To activate this feature on your mobile device, click the photo, tap the three dots on the top right of the screen, and then tap Grab image text. On the desktop version, the three dots are located at the bottom of the screen. The stylus icon within Google Keep works on the desktop version by with your mouse, and on the mobile devices and tablets by using your finger or stylus. You can customize the color and switch between pen, marker or highlighter. You can also tap the eraser to start over. Access the stylus on the desktop by tapping the three vertical dots at the bottom of a note, and on mobile devices by taping the + sign at the bottom of the note. You can also use the stylus to take notes, and use the app to transcribe the note into text by with Grab image text. Turn any note into a checklist by tapping or clicking the plus sign at the bottom of the screen. When you check off an item as done, Keep moves the item to the bottom of the note, with a line crossed through so that you can see completed tasks. Keep lets you share notes with contacts, automatically syncing any updates or additions across the team of collaborators. To share a note, tap the three buttons at the bottom of the screen and tap collaborators, and enter the email addresses of the collaborators. On the desktop version, the collaborator icon is at the bottom of the note. This is handy for sharing a family grocery list that automatically updates as people purchase items and cross them off the list. See more about syncing below. Google Keep data syncs to the cloud through an internet connection. Keep is still available offline, but any new notes, or edits to existing notes will not be synced until you are connected to the internet. Syncing is automatic, regardless of the device you are using to access Keep. To open your Keep notes on any device, simply log into your Google account. As part of the Google family of products, Google Keep integrates with Google Calendar and Google Maps. Tie a due date to a Google Keep note by clicking the bell reminder at the bottom of the note on the desktop version and add a date and time. The bell reminder is at the top of the mobile app. You can also create a location-based reminder so that Keep will send you a location-based alert whenever you are in the geographic area you assigned. Location services must be turned on your device for this to work. Location based reminders are helpful when running errands, or to help you remember what you need from the grocery store. You can copy a Keep note to a document by copying it to Google docs. On the desktop, click the three dots at the bottom and select Copy to Google Docs. To open the Google Doc, in the bottom left of the window, click Open Doc. If you need to print a Keep note, copy the note to a Google Doc and print the doc. On your desktop, Android and iOS devices, select the Note from your Keep app, and tap the three vertical dots at the bottom of the screen. Tap Send, and select the action or app to share. On the desktop, the only option is to copy to Google Docs. Once you send or share a note, the note is still available in Keep. The Google Keep Chrome extension adds the Keep icon to the top of your browser. When you are on a web page that you'd like to save, click the Keep icon and Keep will create a new bookmark of the page. Keep will also copy any text you highlight from the web page on the same note. You can continue to copy text from the article, by clicking the Keep button, and Keep will continue to add the text you highlight to the same note. On Android, send a bookmark to Google Keep by tapping the three dots at the top of the web page you want to save, and tap Share link. Select Keep from the apps that appear. On iOS, tap the share button while visiting a web page you want to save, and select Keep. Keep will automatically create a note. If Google Keep does not appear as an option, tap more and add Google Keep to the list of options. Google Keep is a free app, with no monthly limits on how many notes you can create, and no bandwidth limits. Each note has a character limit of 20,000 characters.